Research on applied memory is one of the most active, interesting and vibrant areas in experimental psychology today. This book provides descriptions of cutting-edge research and applies them to three key areas of contemporary investigation: education, the law and neuroscience. In the area of education, findings from the study of memory are described which could have a major impact on testing practice, revision techniques for examinations and teaching basic literacy and numeracy. In applications to the law, recent findings shed new light on the dynamics of child abuse investigations, the status of traumatic memories recovered after long delays and a further challenge for the eyewitness: change blindness. Finally, in neuroscience, contributions cover the frightening question of whether patients can remember incidents during surgical operations under anaesthetic, the unexpected impact of handedness and rapid eye movements on memory proficiency and the status of déjà vu: mystical experience or memory error? 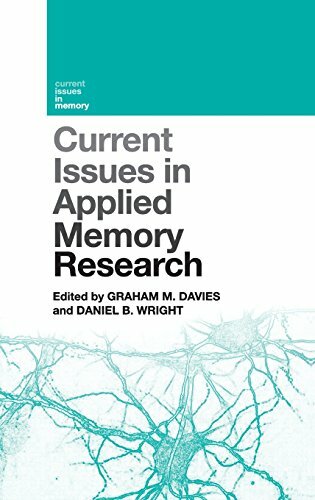 These accounts of recent research on applied memory have been written by leading experts in the field from both Europe and America, with the non-specialist in mind. They will interest students who wish to extend their reading beyond core material in cognitive psychology, graduates on more specialised courses in education, forensics and neuropsychology, and all those who wish to enrich their knowledge of the contemporary frontiers of applied memory research. Research on applied memory is one of the most active, interesting and vibrant areas in experimental psychology. This book describes cutting-edge research and applies it to key areas of contemporary investigation: education, the law and neuroscience.